This dissertation aimed to identify the linguistic characteristics of specific language impairment (SLI) as it presents itself in Afrikaans. 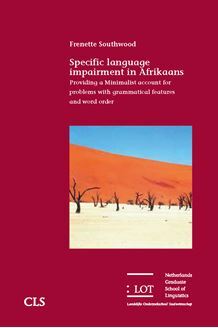 The study ascertained whether (i) the comprehension and production of grammatical morphemes by Afrikaans-speaking children with SLI are delayed and/or deviant; (ii) the predictions made by current linguistic accounts of SLI are borne out by the Afrikaans data; and (iii) there is a need for an alternative, comprehensive account of SLI as it presents itself in Afrikaans. A series of experimental tasks was performed with three groups of Afrikaans­speaking children (6-year-olds with SLI, and typically developing 4- and 6­year-olds), and spontaneous language samples were collected. The children with SLI presented like younger typically developing ones on the experimental tasks, but, in terms of the spontaneous production of grammatical morphemes, they fared worse than both typically developing groups. Furthermore, certain word order errors were made only by the children with SLI. It appears then that the language of Afrikaans-speaking children with SLI is not merely delayed, but also somewhat deviant. The predictions made by current linguistic accounts of SLI were not borne out by the Afrikaans data. The alternative account proposed here is that the problems Afrikaans-speaking children experience with grammatical morphemes and word order are related to problems at Spell-Out at PF. The problem appears not to lie in the computational system as such, but with syntax-phonology mapping. These children have difficulties choosing the correct form for Spell-Out, which may be related to the fact that these Spell-Out forms are not (yet) stored in as organised a manner as they are in the adult lexicon.